In all homes across Singapore, residents are able to draw water to their sink faucets, showers, bathtubs, appliances and more through their plumbing system. The plumbing system features a network of pipes that run under the home and through the walls of the house. While these pipes are designed to be durable and to provide a resident with many years of use without hassle or concern, the fact is that a pipe leak can occur from time to time. A pipe leak can be very small in size, and only infrequent drips of water may spring from the damaged area. On the other hand, a pipe leak can also be huge, and water can gush from the pipe at a rapid pace. While the latter may appear to be the serious issue, the fact is that all leaks should be treated as urgent repair items and should be repaired quickly by a professional plumbing company. The cause of your pipe leak may not be foremost on your mind when you first discover the issue, but it is important to understand what caused it. This is because identifying the cause can help you to take actions that will prevent the issue from developing again in the future. Some leaks will simply develop because pipes can get weaker with age or when unnecessary stress is placed on them. At the joists or connections, the connections may become slightly looser and may simply need to be tightened with a wrench from time to time. For the pipes that are located outside the home and that carry water into the home, tree roots can penetrate into these pipes to cause leaks. A pipe leak can cause a considerable amount of damage to a home in a very short period of time, and because of this, it is important that residents are always watchful for signs of a leak. Some leaks are so large that the presence of a pipe leak is difficult to miss. For example, if a pipe has burst in the ceiling, a resident may quickly notice water pouring in from the ceiling and falling into the room below. Other leaks are very small in size and may not be discovered for days or even weeks. For example, a slow drip in the pipe under a bathroom sink may not be discovered until the resident opens the bathroom cabinet and discovers a pool of water. Any signs of moisture on drywall, carpeting, cabinetry or other surfaces should be investigated by a plumber. Keep in mind that some leaks may not have any visible signs. Therefore, you should regularly inspect your water bill to ensure that the amount owed remains relatively stable or adjusts with your use as expected. A sharp and unexplained increase in the water bill should be investigated by a plumber. 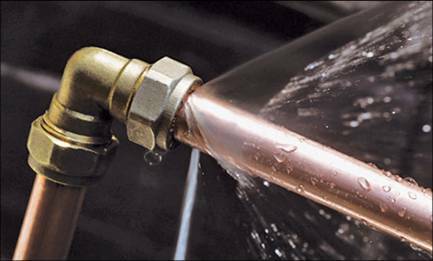 Whether you see the visible, obvious signs of a leak in your home or you merely suspect that you may have a leak, it is important to diagnose the presence of a leak and to have the area repaired professionally without delay. Any amount of moisture or water in the home can cause damage, so even slow leaks should be addressed right away. The water leak itself can cause staining and spotting on carpeting and other similar surfaces. It can also cause wood surfaces like cabinetry, wood flooring and other areas to warp or rot. When moisture is present in the home for more than a day or two, there is an increased likelihood that mould will begin growing. This may result in the need for professional mold remediation services. In addition, a pipe leak can also cause your water bill to be inflated, and the water bill may continue to be higher than normal until the leak is repaired. This is why stopping a leaking pipe is important. Delay’s as such can be detrimental. How our plumbers can assist you in the pipe leakage? Our company have been in the industry for more than 20 years, developing to one of the leading plumbing company in Singapore. We are experience in dealing with various type of pipe leakages, including both concealed and expose pipe. Unlike a handyman whom is a jack in all trade, we specialize in only plumbing repair work. By engaging us, you are assured that the technician that will be handling your case is someone whom have undergone the necessary courses conducted by BCA. This in return allows us to provide our clients with quality workmanship on matters with regards to plumbing including pipe leaks. When you initially suspect a leak, you should first stop the flow of water into your home. Each home has a main water supply that you can access to shut off water to all pipes in the home. Depending on where your pipe leak is located, you may also be able to use a shutoff valve located closer to the leak. For example, if the leak is located under the sink, the shutoff valve under the sink can stop the water flow to that pipe while enabling you to continue to use water elsewhere in the home. You may also consider cleaning up the water with a mop, towels or other items. Then, you should call a reputable plumbing company that can arrive at your home quickly to provide you with fast pipe leak services. In some cases, the location of a leak is easy to locate. When the leak is in a location of pipe that is exposed or visible, such as the pipes under the kitchen sink, simply inspecting the pipe can tell you where the leak is located. After the leak is located you can consider replacing the leaking pipe yourself. However, if the leak is located in one of the pipes inside the walls, professional diagnostic services are the best way to locate the leak. Some plumbers will cut away drywall to find a pipe leak. However, if the plumber’s initial guess about the location of the leak is wrong, additional drywall will need to be removed. Other plumbers may use advanced diagnostic techniques to pinpoint the location of the leak without cutting into the drywall, and this is a preferred option that can decrease the damage that is done to the home. We are the Singapore plumbing company to call for a pipe leak or pipe burst repair in your home. Immediately after shutting off the flow of water to the pipe, take the important step of calling our office for a pipe leak repair service. We are committed to providing our customers with the highest level of service possible, and we will respond to repair requests quickly. For pipe leak repair or other plumbing services, call our office now.